Net Weight: Packet (900 seeds)1oz (20000 seeds)(+$6)1/4lb (80000 seeds)(+$15)1/2lb (160000 seeds) (+$24)1lb (320000 seeds) (+$30) This item is currently out of stock! 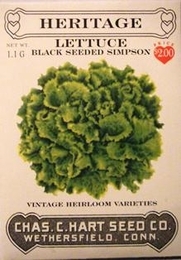 Developed by Peter Henderson of New York back in 1870, this crisp leaf lettuce is still the most popular leaf lettuce grown in America today. This fine loose heading variety produces a compact bunch of crisp brittle leaves of excellent flavor in a very short time. Plant seed outdoors as soon as the ground can be worked. Plant in rows 15 inches apart spacing seeds 1 inch apart. When plants are 3 to 4 inches tall, thin plants to space 6 inches apart. Lettuce can be planted until August.